Here’s a new and important book that helps us make sense of the changing business landscape. 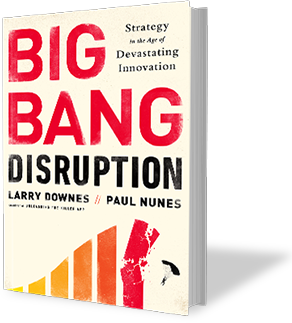 It’s Big Bang Disruption: Strategy in the Age of Devastating Innovation by Larry Downes and Paul Nunes (from Accenture) – and it describes how so many businesses are disrupted overnight by big-bang innovations that come out of nowhere. The insights presented by the book add new perspectives to the work on disruptive innovation by Clayton Christensen and gang. 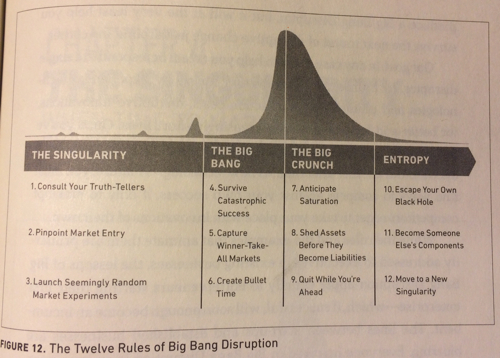 According to the authors, the big-bang disrupters may not even see you as competition. They’re not sizing up your product line and figuring out ways to offer slightly better price or performance with hopes of gaining a short-term advantage. One of the examples is the GPS system. Do you even remember Garmin, or TomTom or Magellan? They were all disrupted by the smartphone – with Google Maps leading the way. And the smartphone isn’t done yet. It has wiped out the wrist watch industry, threatens the digital camera market, the video camcorder market, and even the music and TV industries. CampusBookRentals and Khan Academy in education, Pandora and Spotify in radio and recorded music, Skype and FaceTime in voice and video calling, and Square in mobile credit-card processing. These offerings’ lightning-fast adoption is a function of near-perfect market information. Wherever customers are, mobile devices let them search a wide range of specialized data sources–including online sites like Yelp, TripAdvisor, Amazon, and other free databases of user-generated reviews–to find the best price and quality and the next new thing. 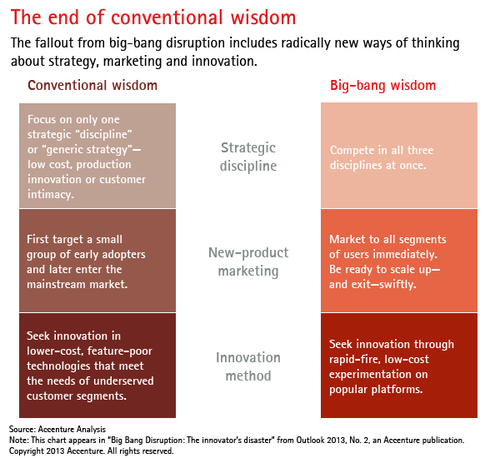 What’s more, big-bang disruptions go far beyond information-based goods and services. Restaurants, for example, now depend on online reservations, customer-generated reviews, e-coupons, and location-based services to drive business. 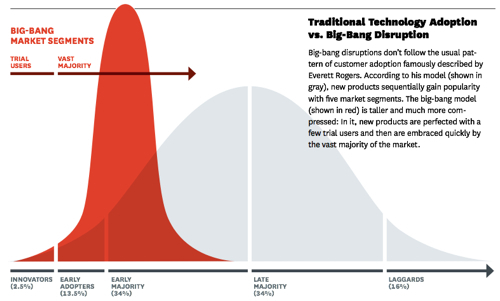 What this “shark-fin” curve means is that incumbents don’t have time to catch up. The crossing-the-chasm story is over. New products are perfected with a few trial users and then are embraced quickly by the vast majority of the market! unique passion for its mission, its products and its customers. My term for these guys is thought-leaders, or if you want to be real – they’re the ubernerds. them is hard. Learning to listen to them is even harder. I personally don’t think our Fortune 100 companies can adopt this sort of thinking very easily, so I’m looking for a lot of them to get dinged severely by the Big-Bang Disrupters, some of which will come to us from India and China. 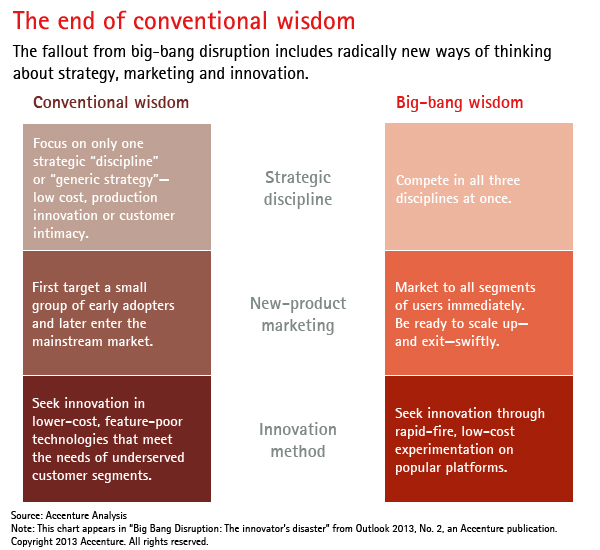 Still, the framework they present is compelling – especially the part about leaving the market before you get disrupted in the end. Finally, one of the key elements of Big Bang Disruption is the replacement of the traditional supply chain by dynamic, ever-shifting ecosystems. Again, the culture of most traditional institutions can’t embrace openness or collaboration. I’ve had some experience in that department. 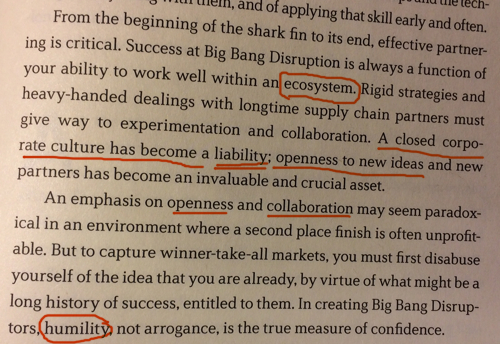 Keep this in mind; I’ll be back very soon with a blog post on ecosystem strategy. Previous PostPrevious Houston METRO: What Will It Take to Become World Class?